Ms. Bethany Walton is the manager of the Mass. 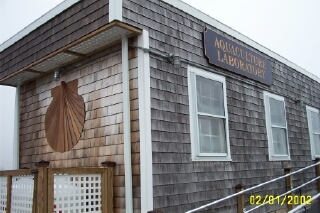 Maritime Academy Aquaculture Center. She is cleaning algae fouling off a scallop in photo above. 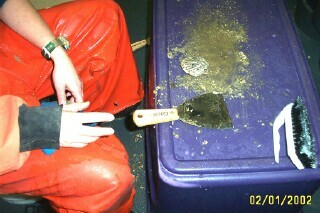 This project was a spin-off from the elective course on Marine Adhesives. We learned that aquaculturists wish to glue high-value seed shellfish to netting so that when they reach maturity, they can be easily harvested. This part of the project is a collaboration with the Massachusetts Maritime Academy, the Woods Hole Oceanographic Institution, and the Martha's Vineyard Shellfish Group. A student intern was hired to work on the project. A high school group and a community college group participated in field trips.